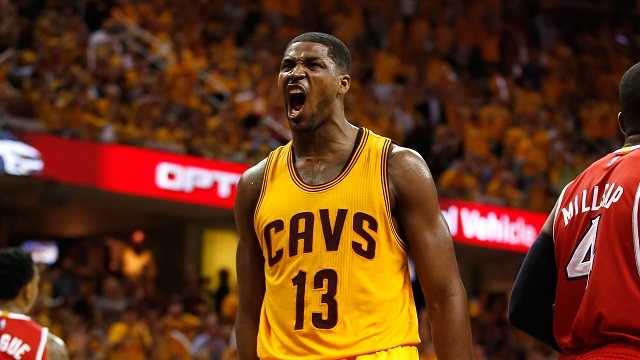 On October 1st at midnight Tristan Thompson let his qualifying offer with the Cleveland Cavaliers expire. The Cavs declined to offer Thompson a new contract that was acceptable to him and his agent and Thompson was unwilling to sign a $6,777,589 qualifying offer and play one year for less than his perceived market value. By letting the qualifying offer expire without signing a new multi-year contract, the parties closed off some options to move forward. However, there are several options remaining and this article will explain those in detail. The $6.7M qualifying offer is obviously off the table. If Thompson had signed it, he would have become an unrestricted free agent next summer with the freedom to sign with any team he so chooses. The Cavs are already well over the luxury tax with a team salary of over $95M and having Thompson sign the one year qualifying offer for a modest, under-market salary would have saved them significant money on their tax bill by. The Cavs could have avoided the October 1st deadline, keeping the qualifying offer on the table for an extra five months until March 1st, but they declined to do so. This ultimately makes sense. There is no reason to believe any amount of extra time would make Thompson take a deal he simply does not want to sign, especially when it means leaving millions of dollars on the table this year (over eight figures if you ask anyone in Thompson’s camp). Although the qualifying offer expired, Thompson and the Cavs can still come to an agreement for any amount of money and years (as long as the conform to the standard salary restrictions, obviously). Moreover, the signing can take place at any time before the end of this season. If the parties cannot come to a deal before the end of the season, Cleveland can keep its matching rights and Thompson will remain a restricted free agent so long as the Cavs extend another qualifying offer on or before June 30, 2016. This would create a number of problems. Thompson would be heading into restricted free agency a full year after his impressive NBA Finals appearance, spending an entire season removed from NBA basketball. If no teams are willing to give him a max contract now, there is no reason to believe any team will sign him to an even higher max contract in 2016 if things play out this way. The Cavs, on the other hand, go a whole year without having an impact player on their roster; one who would undoubtedly help them if they made it to the Finals against any of the top five teams in the Western Conference. So both sides have something to lose by not coming to a deal before the season starts and even more to lose if this bleeds into, or all the way through, the 2015-16 season. It is important to note that Thompson is still a restricted free agent and Cleveland still holds the right to match any offer sheet he signs even though the qualifying offer expired. Thompson could force Cleveland to pay his asking price if another team wanted to tie up their cap space for three days and signed him to an offer sheet. The problem is that almost no one has the cap space to do it. For a team to entice Thompson, they will likely need to offer at least $17.67M dollars. The only team with enough space to even pull that off is the Portland Trailblazers, who cannot be all that motivated to go through with such a deal. So while this option is a viable one, it is incredibly unlikely. Although, outside of Portland, nobody has the cap space to even attempt to sign Thompson to an offer sheet (though a preemptive trade or two and roster clearing could make it possible for a team like Utah and Philadelphia), trades are always an option. This brings us to the possibility of a sign-and-trade. A sign-and-trade is doable from Cleveland’s standpoint, but there are limitations and a weird CBA rule that affects what the Cavs can get return. First, a sign-and-trade must be completed before the beginning of the regular season. Second, for a strictly two-team deal involving Cleveland and one other team, the only teams that can absorb Thompson must do so while also staying under the apron ($4M above the luxury tax). Any team above the apron cannot receive a player in a sign-and-trade transaction. This means that outside of the Trailblazers, no other team could do a two team sign-and-trade with Cleveland without first making a separate, unrelated trade. The Cavs could take a player back in return but if they’re worried about their tax bill, they would likely forego that option and receive future assets and a sizable trade exception instead. While all of this is based on CBA rules and restrictions, the trade exception aspect begets the most unique rule: If a team is over the salary cap and sends a player to another team in a sign-and-trade transaction that results in a trade exception, the trade exception amount is limited by the greater of (i) the value of the last season of the original contract or (ii) 50% of the first year of the new contract. For example, if Thompson was signed-and-traded on a deal that pays him $9M in 2015-16, the Cavs would receive a trade exception for $5,138,430 (or Thompson’s 2014-15 salary). Alternatively, if Thompson was signed-and-traded on a deal that pays him $17M in 2015-16, the Cavs would receive a trade exception for $8.5M. The right amount and quality of draft picks might make this discount worth it but it’s a big hit to take, especially when a win-now team is unable to acquire any pieces in such a trade that would help them this season. A team other than the Trailblazers could participate in a sign-and-trade to land Thompson, but they would likely rope in the Portland as a third team facilitator. For example, let’s say Dallas wants to receive Tristan Thompson and is willing to pay him $17.67M in year 1. Dallas could not do a two team sign-and-trade with Cleveland because Dallas is over the salary cap and, as such, would need to send a player somewhere in order to take on Thompson’s salary. If Cleveland did not want to receive any players in return and save on their tax bill, Dallas could hypothetically get Tristan Thompson by sending Chandler Parsons to Portland, who has enough cap space to absorb his $15.3M contract. Cleveland would then sign-and-trade Thompson to Dallas, who can absorb his contract through salary-matching rules, and Portland and Dallas could send Cleveland a collection of draft picks in return. Washington could hypothetically do the same thing by sending Nene ($13M) and Dejuan Blair ($2M) to Portland for Tristan Thompson. In either case, Cleveland would end up with draft picks and an $8.83M trade exception that would expire in one year. Clearly there are options in which Thompson plays in the NBA this season and the most likely option is that he and the Cavs come to an agreement. But with only 12 days until the start of the regular season and an apparent unwillingness to budge from either side, there’s no telling how long this will last and what the outcome will be. The Cavs can sign him to a deal for up to 5 years, $94M. In the CBA, “season” is defined as the first day of training camp through the last game of the NBA finals. Or 3 years, $53M, allegedly the lowest deal Thompson’s camp is willing to accept, although it could be structured with annual 4.5% raises. This also means any team that receives a player in a sign-and-trade is hard-capped at the apron for the remainder of the season. Note: This post was edited on 10/22 to clarify the sign-and-trade rules.